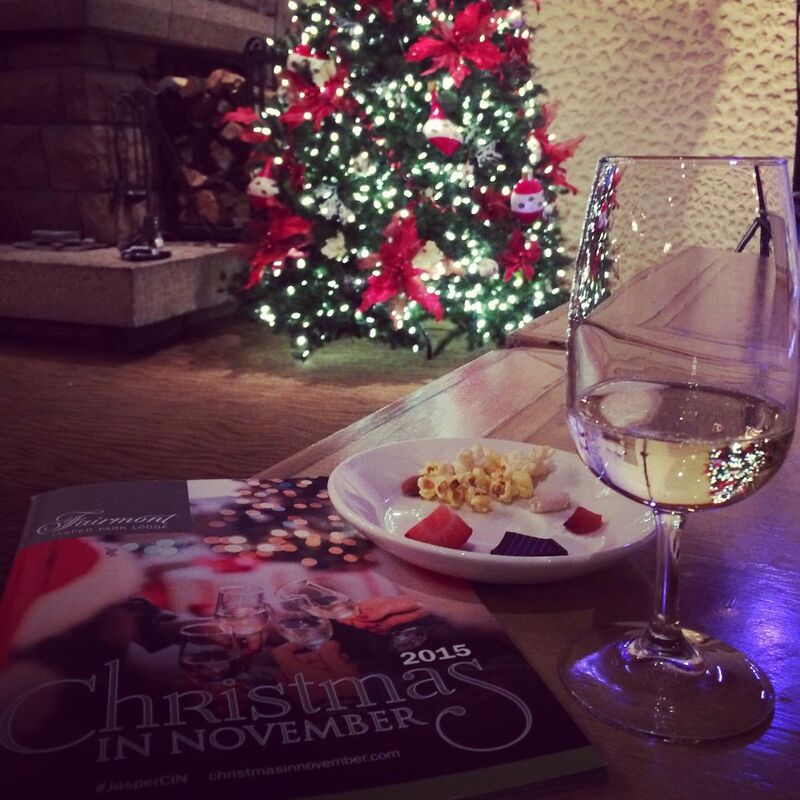 Christmas in November at the Fairmont Jasper Park Lodge is a magical event. This year I had the pleasure of attending two packages of Jasper CIN: the first weekend package for Alberta Pork and the final weekend package in support of Taste Alberta. Christmas in November involves a number of culinary and design sessions led by an assortment of talented presenters who instantly get you in the holiday spirit. During Chef Andrew Whiteside‘s culinary session on traditional Italian cuisine my sister and I fell in love with the cream sauce accompanying one of the dishes. Chef Whiteside let us in on the secret behind the sauce served in Orso, the Fairmont JPL’s newest restaurant. Naturally gluten free, the leftover parmesan rinds and bits of garlic are thrown in a pot with whipping cream and simmered until it is thick, creamy, and delicious. Full fat, but full flavour! Participants in the VIP package at CIN had an opportunity to join a kitchen party hosted by Anna & Michael Olson. I tagged along where the menu included a grilled mountain of meat. Michael glazed a pile of perfectly grilled pork chops with a simple combination of 1/3 white vinegar, 1/3 hot dog mustard, and 1/3 brown sugar. I grabbed one of the bones and dredged it the leftover sauce – it will definitely be my go-to sauce for holiday pork chops. My first weekend at CIN I was seated at a table with Robert, who is a sales rep for Agropur. As we were discussing some of the Canadian cheeses the brand carries, Robert informed me that Save On Foods carries a cheese party pack for the holiday season. I love cheese and I love a bargain. I picked one up this week for $29 which includes five cheeses I plan serving at a dinner party next week. I attended the Charton-Hobbs Bubbles, Bubbles, Bubbles session both weekends of Jasper CIN. As I was sampling a cava, sparkling wines and champagne I learned a few things. First, cava is made in the same method of champagne, but can be found at a much more reasonable price. (Plus it is from Spain so I feel like i’m supporting The Spaniard’s homeland economy). The bottle Poema Cava we tried retails at less than $20. At dinner one night we had a couple of bottles of Moet & Chandon. After the 1st glass everyone moved onto white or red wine (which conveniently left more bubbles for me). In the session I learned that bubbles are not just to start a meal – they can be enjoyed throughout your whole meal (which is exactly what i’ll be doing this holiday season). I have to admit – after CIN I have a chef crush on Massimo Capra. He is not only inspiring – he is hilarious! In his session I watched him wrap strips of pancetta around pieces of quail. The recipe was simple but the impact on the plate and the flavour of the delicate bird was powerful. I can’t wait to elevate my game with this beautiful dish. Check out the recipe for roasted quails with pancetta posted on Gastropost here. I had the pleasure of sitting with Christine Cushing and her husband and social media star Bosco in the dining room for the second package of Jasper CIN. At our first lunch together Christine learned that I had celiac disease when she saw that I was receiving modified meals. When I headed to Christine’s session after lunch, she was kind enough to make a gluten free version of sweet potato gnudi for me and another celiac in the session. While I was familiar with gnocchi – it was my first time trying gnudi. Paired with sage butter sauce – my tastebuds were so happy! Check out the recipe here.